On Thursday, 6 July 1944, one month after the D-Day invasion of the European Continent, the front page headline in the European Theater of Operations edition of The Stars and Stripes was “Hand-to-Hand Battle Rages in La Haye.” On page four, it reports on D-Day Invasion heroics which won a 4th Infantry Division chaplain a Silver Star. WITH THE FOURTH INFANTRY, France, July 5–Eleven men of this division, including a chaplain, have received Silver Stars for gallantry in action in the Normandy campaign, and 33 others -26 officers and seven sergeants- Bronze Star Medals for meritorious service from June 6 to June 14. The Silver Star awards were made at a public ceremony in Cherbourg before more than a thousand soldiers and French civilians. London: The Stars and Stripes, Vol. 4, No. 210. Thursday, July 6, 1944. pg 4. 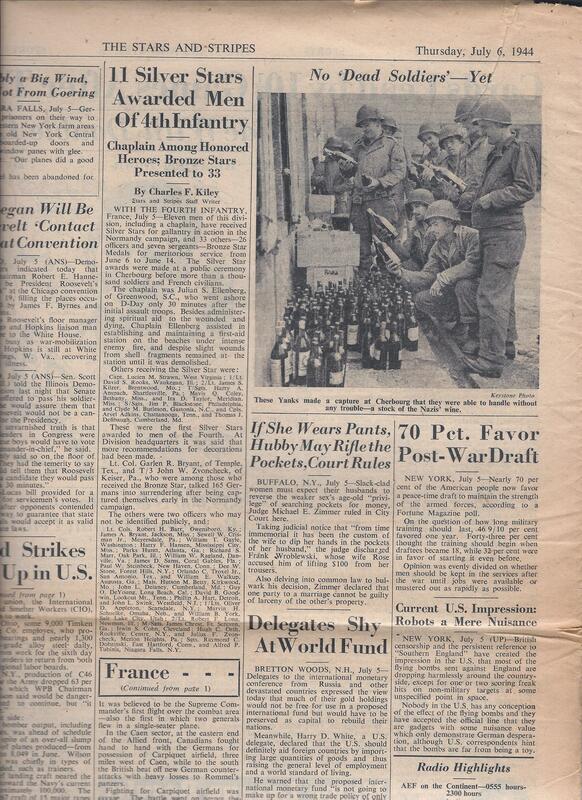 “The Stars and Stripes, Daily Newspaper of U.S. Armed Forces in the European Theater of Operations. Vol 4, No 210, Thursday July 6, 1944” (Author’s collection).